UP Board 10th Admit Card 2019 is expected to release soon at official website of UPMSP Prayagraj i.e. http://upmsp.nic.in. The UP Board High School Admit card 2019 is the important document to enter in the examination hall. 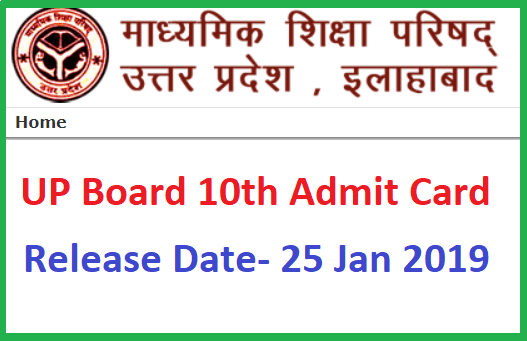 Uttar Pradesh Madhyamik Shiksha Parishad will upload the UP Board 10th Admit Card 2019/ UP Board 10th Class Pravesh Patra 2019 (Roll No. Card) in the last week of January 2019. AS per UP Board 10th Time Table, Board of Secondary Education Uttar Pradesh is going to conduct High School (10th Class) Examination from 7th February 2019 to 28th February 2019. The UP Board 10th Admit Card 2019 download link will be activated soon. UP Board 10th Admit Card 2019 will be available in the last week of January 2019. How To Download UP Board 10th Admit Card 2019 online? Now you can download your High School Roll No. Card (Pravesh Patra).